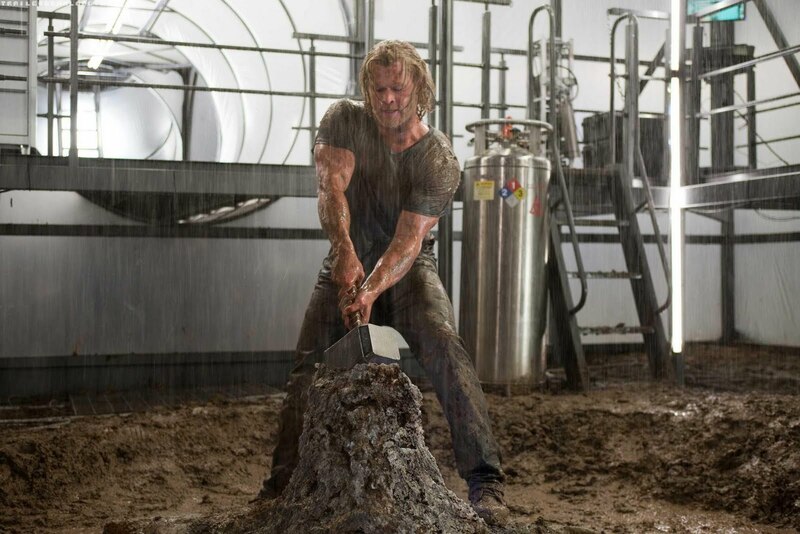 By Odin’s beard, Thor shouldn’t have worked as well as it does. The movie’s based on an oddball cult fave comic-book property brimming with borderline silly quasi-mythological gobbledygook, set in a hallucinogenic world conjured up by artist Jack Kirby, Marvel’s legendary master of miraculous milieus. It’s been assembled by a team of five (!) credited writers and a classically-trained Shakespearean director untested in the modern blockbuster arena, operating under the dominant rule of a company notorious for compromising individual works in service of their larger film universe game plan. And the whole shebang hangs on the broad shoulders of a dashing Aussie unknown whose best-known screen credit was a five minute appearance in J.J. Abram’s Star Trek reboot. Herculean odds be damned! 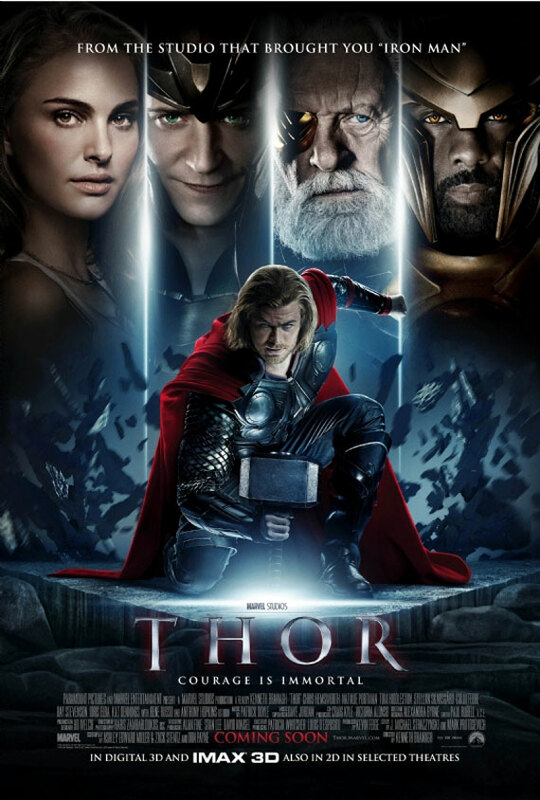 Kenneth Branagh’s Thor is one of the more breezily enjoyable crowd-pleasers in quite some time; a boisterous, hearty slab of superhero movie-making with charm and whimsy to spare. Based on the Marvel Comics protagonist, who first sprung forth from a modest 13-page Stan Lee and Larry Lieber-scripted tale contained within the pages of Journey into Mystery #83 waaaay back in 1962, Thor traces the intergalactic travels of a spoiled soon-to-be king who must learn a necessary lesson in humility. Or else. The story opens in the far-off realm of Asgard, as the titular hero (Chris Hemsworth), the robust, but rash, son of King Odin (Anthony Hopkins), is preparing to accept his father’s place on the throne. However, during the coronation, the kingdom is infiltrated by a group of Frost Giants, denizens of the rocky, icy planet of Jotumheim, seeking a magical power source long ago captured during wartime by the Asgardians. After their attempt is thwarted, Thor seeks revenge – against the strict orders of his father – and, alongside his brother Loki (Tom Hiddleston) and small cadre of warrior pals, travels to the Frost Giant homeland to decimate the hulking blue beasties. After the attack results in a bitter end to peace between the two worlds, Odin strips his arrogant son of his godly abilities and invincible hammer weapon, dubbed Mjolnir, and plunges him to Earth – New Mexico, to be more specific. 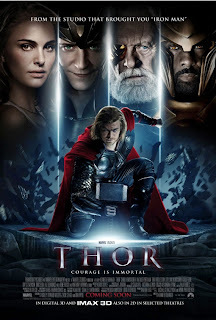 Following a dusty desert automobile collision, he’s befriended by a pair of astrophysicists, Erik Selvig (a very game Stellan Skarsgaard) and the lovely Jane Foster (Natalie Portman – energetic in an underwritten role), who attempt to make sense of the lusty bearded being. While Thor, alongside his mortal helpers, searches for a means of returning home, Loki wrestles rulership of Asgard from Odin and puts a nefarious plan into action involving the Frost Giants and a towering, titanium, Gort-like goliath called the Destroyer. In order to face the impending threat, the once mighty warrior must prove himself worthy of lifting Mjolnir from its new earthly resting place and earn back his formidable superpowers. With its multiple epic locations, sizable ensemble cast (there are over a dozen major speaking parts), Avengers tie-in material and weighty father-and-sons drama, Thor could have been a logy, ponderous mess of exposition and unwieldy storytelling. Yet somehow Branagh and his writers have massaged their bulky material into a high-spirited, briskly-paced adventure yarn – edited to near economic perfection by Paul Rubell - that never gets bogged down by unnecessary details or distractions (the scenes involving SHIELD actually feel organic to the story – something that’s couldn’t be said of last year’s Iron Man 2). The director’s ability to tap into the stirring humanity of his characters is always front-and-center. Thor is more engaging as a vehicle for character interactions, both humorous and intensely melodramatic, than for its special effects and action, which are serviceable enough but hardly earth-shaking (Though Asgard’s rainbow bridge, Bifrost, a dazzling visual creation, deserves special mention). Even if the script occasionally falters – Loki’s grand scheme doesn’t hold up to much scrutiny – and the film’s ambitions aren’t as lofty as some of the more noteworthy superhero films, Branagh establishes such a bouncy, disarming tone that it’s hard not to be swept up by his colourful exuberance. As Thor, Chris Hemsworth is a true find. Commanding and sympathetic, with a sharp sense of comic timing and strong physicality, the star’s presence is as crucial to the film’s success as Robert Downey Jr. in the Iron Man pictures. Although he’s often surrounded by a number of cinema’s very best acting talents, Hemsworth’s charisma looms large in every scene. Hiddleston also impresses as the villainous Loki, whose own emotional journey is just as important as that of the brawny hero. The stealthy, black-maned Brit often seems to be channelling Iago, with his wry gift for verbal trickery, but displays little of that character's malicious glee. His Loki has a victimized underdog quality that earns him a spot in the pantheon of the genre’s most compelling supervillains. Among the supporting cast, an unrecognizable and imposing Idris Elba, playing Heimdall, the guardian sentry of the portal connecting Asgard to Earth, is a stand-out. Despite being buried under a potentially giggle-inducing mountain of golden armour, the actor projects hard-as-iron noble grandeur. He makes us believe that even Thor or Loki would think twice about crossing him. Also notable is the always welcome Kat Dennings, as the astrophysics team’s intern Darcy, who delivers the lion’s share of the film’s biggest laughs. Thor feels like a film made by people who genuinely cared about telling an entertaining story with endearing, interesting characters. Branagh and his crew respect the intelligence of the audience, and understand that CG and stunts can only carry an expensive comic-book movie like this so far. Considering the usual standards for blockbuster filmmaking, it’s a refreshing approach that, as far as I’m concerned, is pretty much akin to godliness.